Men with cardiovascular disease and ED were twice as likely to die from all causes than men who did not have erectile dysfunction. And those with ED were 1.6 times more likely to suffer from a serious cardiovascular problem such as a heart attack or stroke. Erectile dysfunction is something that regularly should be addressed in the medical history of patients; it might be a symptom of early atherosclerosis. Men with ED who are going to a general practitioner or a urologist need to be referred for a cardiology workup to determine existing cardiovascular disease and proper treatment. ED is an early predictor of cardiovascular disease. Study: Erectile dysfunction may indicate heart disease, death risk - CNN.com. 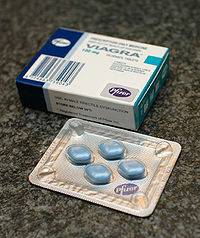 Image source: Viagra (sildenafil), Wikipedia, GNU Free Documentation License.